[222 Pages Report] The variable data printing market size in labels is estimated to grow from USD 9.39 Billion in 2015 to reach USD 22.27 Billion by 2021, at a CAGR of 15.61%. The variable data printing market in labels is gaining tractions from end-use sectors such as food & beverage, pharmaceutical, and consumer durables. The base year considered for the study is 2015 and the market size is projected from 2016 to 2021. The primary objective of the study is to define, segment, and project the variable data printing market size in labels on the basis of label type, composition, printing technology, end-use sector, and region. It also provides detailed information about the main factors influencing the growth of the market (drivers, restraints, opportunities, and industry-specific challenges), strategically analyze the micromarkets, analyze opportunities for stakeholders, provide details of competitive landscape, and strategically profile the key players with respect to their market share and core competencies. The value chain of variable data printing market in labels includes printing machinery manufactures such as HP Inc. (U.S.), Canon Inc. (Japan), Xerox Corporation (U.S.), R.R. Donnelley & Sons Company (U.S.), Quad/Graphics Inc. (U.S.), and Cenveo, Inc. (U.S.) among others. It also includes label manufacturers such as 3M Company (U.S.), Mondi Plc. (South Africa), Avery Dennison Company (U.S.), and WS Packaging Group, Inc. among others. Furthermore, the products are used by the food & beverage, consumer durables, pharmaceutical, home & personal care, and retail companies such as Nestle S.A. (Switzerland), Kellogg Company (U.S.), Unilever Plc (U.K.), Anheuser Busch Inbev SA (Belgium), Pepsico Inc. (U.S.), Procter & Gamble Co (U.S.), Microsoft Corporation (U.S), Sony Corp (Japan), GlaxoSmithKline Plc (U.K.), and Bayer AG (Germany) among others. 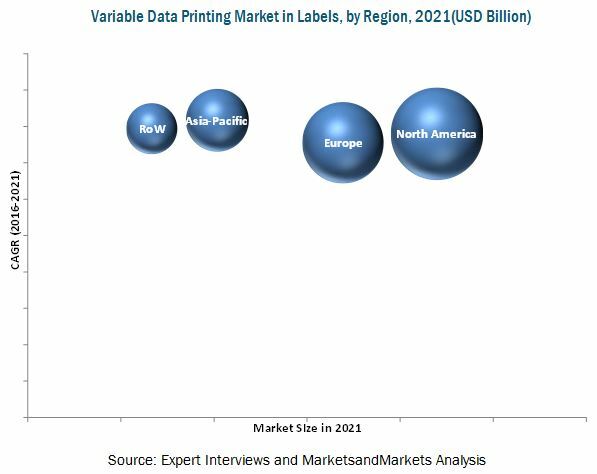 MarketsandMarkets projects that the variable data printing market size will grow from USD 10.79 Billion in 2016 to reach USD 22.27 Billion by 2021, at an estimated CAGR of 15.61%. The global variable data printing market is driven by basic factors, which include strong growth in demand, especially in pharmaceutical, food & beverage and other sectors. These drivers are supported by the high rise in demand from the Asia-Pacific region. Product innovations and technological developments in the market are expected to create strong investment opportunities. This market, on the basis of label type, has been segmented into release liner and linerless labels. The release liner segment accounted for the largest share in the variable data printing market in labels in 2015 and is expected to grow at a higher rate as it can be cut into any shape and size, whereas linerless labels are restricted to squares and rectangles. Variable data printing market in labels, on the basis of composition, consists of facestock and topcoat. The facestock segment had the largest demand in 2015 and is expected to hold the leading position through the forecast period as it can withstand adverse conditions such as high temperature, moisture, and abrasion and is less expensive compared to other composites. On the basis of printing technology, the market has been categorized into thermal transfer, direct thermal, electrophotography, and inkjet. The inkjet printing technology is projected to grow at the highest CAGR from 2016 to 2021 due to the huge demand for this type of printing in the industrial applications as it prints finer, smoother details through higher printhead resolution. The end-use sectors for the market are food & beverage, consumer durable, pharmaceutical, home & personal care, and retail sector. The demand from the food & beverage sector is projected to grow at the highest CAGR during the forecast period. The growing demand of consumer awareness about product ingredients, packed food trends, and rise in the consumption of healthy food has led to the increase in demand for food & beverage sector in variable data printing market. North America dominated the variable data printing market in labels in 2015 and is projected to remain the market leader through 2021. However, Asia-Pacific is projected to register the highest growth rate from 2016 to 2021. Rising disposable incomes and changing preferences of consumers towards informed buying and growing concerns among the manufacturers about the printing of varied data in a cost- and time-efficient manner have driven the growth of this market in this region. High cost of raw materials and new technologies that enable direct printing on the package due to the changing preferences of end-use sectors are the major restraints in the studied market. HP Inc. (HP), formerly known as Hewlett-Packard Company (U.S.), as a key player in the technology products market, has a strong market share in the U.S. It also intends to enhance its product portfolio by providing innovative solutions to businesses. The company has been adopting technological advancements as its key strategy to gain competitive advantage. Owing to its wide portfolio of products and services and technological advancements, the company has positioned itself to offer integrated and comprehensive solutions. 10.3.7.2.1 Facestock is Projected to Grow at A Considerable Rate From 2016 to 2021 in the U.K. Figure 30 SWOT Analysis: HP Inc. Figure 32 SWOT Analysis: Canon, Inc.